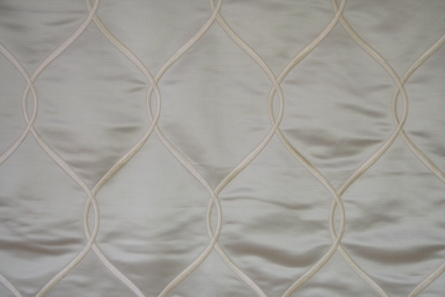 A charming trellis design exquisitely connected to create a fluid and elegant feel. A woven polyester and viscose yarn presents a radiant satin surface with a heavy stitch embroidery layered and refined with a detailed stitched edge. This fabric is available with Swarovski® crystals and can be laminated for textile panelling.